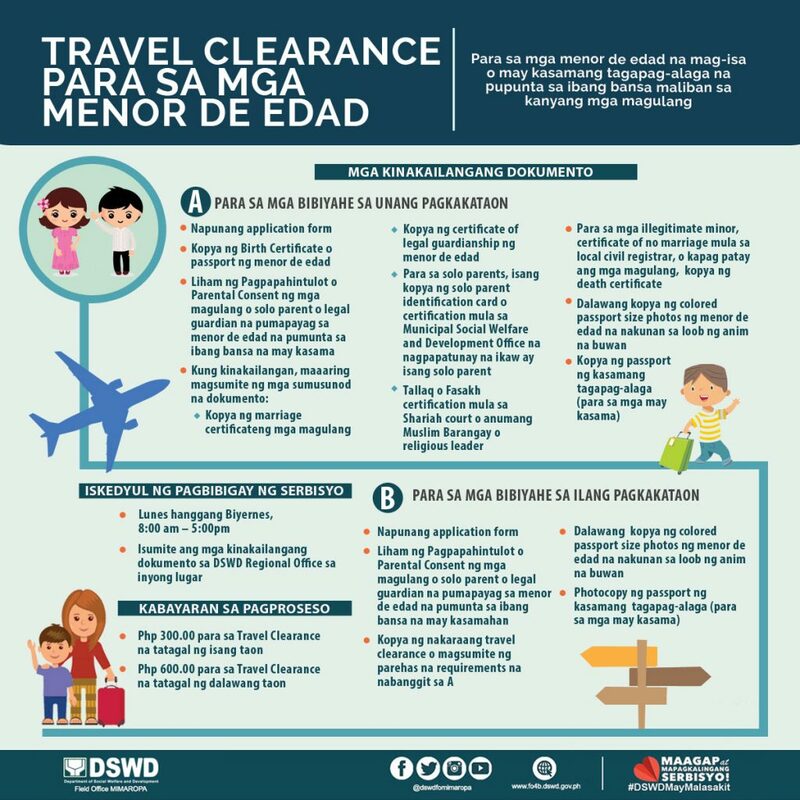 A travel clearance is a document issued by the DSWD to a Filipino child (below 18 years of age) traveling abroad alone or with someone other than his/her parents. A minor traveling to a foreign country accompanied by a person other than his or her parents. A minor traveling abroad whose parents are in the Foreign Service or living abroad or are immigrants, provided he/she is holding a valid pass such as a dependents visa/pass/identification card or permanent resident visa/pass/identification card which serves as proof that he/she is living with parents abroad and their travel does not constitute child trafficking. A minor, regardless of civil status who is traveling alone or with other person/s is required to secure a travel clearance. IS A MARRIED MINOR REQUIRED TO SECURE A TRAVEL CLEARANCE? A minor, regardless of civil status, who is traveling abroad alone or with person/s other than his/her parent is required to secure a travel clearance. surnames and 1-15 days for common surnames. * Issuing office of CENOMAR is the National Statistics Office not the Local Civil Registrar. C. In case of illegitimate children who is traveling abroad accompanied by their biological father, they are still required to secure a travel clearance certificate as parental authority is vested only to the mother of the child, per Article 176 of the Family Code of the Philippines. A DSWD travel clearance is valid for a period of one (1) year from the date of issuance and shall be valid for multiple travels within the validity period, provided the conditions under which the travel clearance was issued have not changed. If a change in condition occurs like a change in traveling companion, a new travel clearance must be obtained. 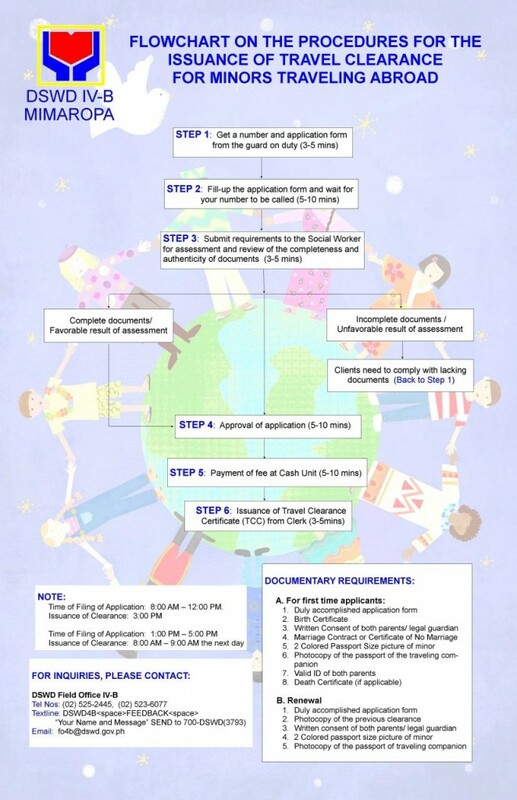 The application for travel clearance, together with the supporting documents required shall be submitted/filed at anyDSWD Field Office. On the appointed date, go to the nearest DSWD Field (regional) office which processed your application to submit the original copy of your supporting documents and pay PhP300.00 per travel clearance certificate. The travel clearance certificate will be obtained thereafter. ARE THE FOLLOWING MINORS EXEMPTED FROM SECURING A TRAVEL CLEARANCE? A minor who holds a valid pass such as dependents visa/pass/identification or permanent resident visa/pass/identification card is no longer required to secure travel clearance from DSWD. A permanent residency card is a valid pass and a holder of such is exempted from securing a travel clearance. It depends on the minors citizenship or residency. A minor who is not a Filipino citizen and holds a foreign passport is not required to secure a travel clearance. A minor who is a Filipino citizen and living abroad who does not hold a permanent resident visa/pass/identification card is required to secure a travel clearance. A minor who is the subject of ongoing custody battle between parents will not be issued a travel clearance unless a Court Order is issued to allow the child to travel abroad with either one of his/her parents or authorized guardian. The family shall be responsible to notify the Bureau of Immigration to include the name of the child/ren in the watchlist of minors travelling abroad. It is therefore the Bureau of Immigration’s responsibility to ensure that no child under the watchlist order leaves the country. IS A FAXED COPY OF THE PARENTAL CONSENT OF PARENTS RESIDING ABROAD ACCEPTABLE? Yes, a faxed copy is acceptable. Likewise, a computer generated photo of minors and emailed documents are acceptable. WHAT ARE THE REQUIREMENTS FOR ILLEGITIMATE CHILDREN ABANDONED BY THE MOTHER AND UNDER THE CUSTODY OF THE FATHER OR OTHER RELATIVES WHO WILL BE TRAVELING ALONE OR WITH THE FATHER OR OTHER RELATIVES? Since the mother has the absolute parental authority over her illegitimate children the father would need to secure a Court Order vesting in him the parental authority over the illegitimate children. If a parental authority has been granted to the father, and the minor will be traveling with the father, he is not required to secure a travel clearance. If the minor will travel alone or with someone other than the father, he/she is required to secure a travel clearance.